The kitchen is helmed by chef Jordan Kahn, who earned distinction early on in his career for being the youngest-ever chef to work at the famed French Laundry restaurant in Yountville, Calif. Yet the restaurant seems to be making headlines more for its controversy than for the food it serves. On Saturday, the business' official Twitter account listed all the people who hadn't bothered to show up for or cancel their dinner reservations with enough notice. "Hi Kyle Anderson (323), I hope you enjoyed your gf's bday and the flowers that you didn't bring when you no-showed for your 815 res. Thanks," snarked one tweet. Below is a screenshot of the trio of shame tweets Red Medicine posted. Restaurant news site Eater LA, who first reported on the public shaming, also carried a long explanation from restaurant manager Noah Ellis about why he decided to blast no-shows that night. Ellis admits that he was frustrated at losing "a bunch of prime tables" during the busiest hours on the busiest night of the week (Saturdays, from 7:30 - 9 p.m.). But in his defense, Ellis also went deeper into the restaurant's decision to improve service for customers by taking on more risk for themselves. Red Medicine takes reservations, doesn't require a credit card to put a name down and doesn't overbook the time slots -- all of which swirled into a perfect storm of no-shows that could have ruined Saturday night's profits. "Invariably, the assholes who decide to no-show, or cancel 20 minutes before their reservation (because one of their friends made a reservation somewhere else) ruin restaurants (as a whole) for the people who make a reservation and do their best to honor it," Ellis wrote to Eater LA. "They probably don't know, and if they know, they probably don't care (or they would have come or called in the first place), but such is life," Ellis conceded about the no-shows he named. Some of Red Medicine's Twitter fans say that publicly shaming no-shows is a way for the small business to protect itself. 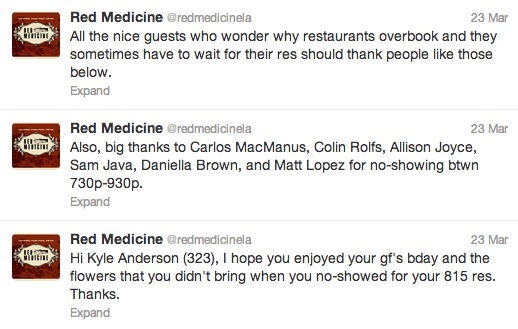 @redmedicinela if more restaurants did this, people might be more respectful. It's like reverse Yelp. But the restaurant has gotten pushback about what Ellis did. Twitter user @AMSTS writes, "what a great way to run a business. Ostracize your customers. Stay classy. I'm going to make ten reservations and no show now." When Red Medicine opened in 2010, it shot to notoriety after the restaurant booted Los Angeles Times critic S. Irene Virbilia from the premises, refusing to seat her. They also snapped a photo of Virbilia and posted it online -- a blow to any food critic's effort to remain anonymous. UPDATE: Someone who claims to be one of Red Medicine's Saturday no-shows wrote an email to restaurant news site Grubstreet LA to explain that a relative had died 20 minutes before the reservation. The letter writer notes that properly canceling the reservation was "the last thing on my mind," but that he or she would have readily explained if the restaurant had called (they had a contact number). "Not sure why they would try and publicly embarrass me in this difficult time for me and my family," the writer continues. "I would not like to be published by name but don't mind you letting them know I won't be back at their establishment anytime soon." Twitter user @Dom_in_ic had previously predicted that at least some of Red Medicine's no-shows would have good excuses for their rudeness. @Dom_in_ic all of them? And do you have to ruin all of my fun every time? We lost 20% of our total reservations on Saturday, and a huge chunk of our primetime bookings. Most diners don't realize the impact no shows make on a restaurant. Losing numerous prime tables, besides hurting a business, is not fair to the guests who take an earlier or later reservation than they wanted originally. We've tried many solutions, including overbooking and taking credit cards. We've considered a ticketing system as well as taking and walk-ins only. In the end, there's no right answer, however at this time we will continue taking reservations. The type of restaurant we've become merits it. We understand emergencies happen, but most diners who no-show most likely don't think twice about it. We'd like them to realize that one short call to cancel can make a big difference. Whether people agree with our reaction, we hope that it brings attention to how all restaurants are impacted by no-shows.